We strive to create competent boaters, winning athletes and life-long river stewards through professional paddles sports instruction and fun river events. The Ark Valley River Riders is a special program for youth and teens in the Arkansas River Valley. The goal of the program is to introduce local kids to paddling in an effort to cultivate competent boaters and winning athletic talent. It is also important to that our paddlers serve their community through boating, and develop a life-long respect and understanding of river stewardship. This community program offers youth paddlers, ages 8 – 18, opportunities to participate in whitewater kayaking and stand-up paddling. Instruction and equipment will be provided by RMOC staff both on the river and at the Salida Hot Springs Pool. The skills taught begin with boat fitting, basic strokes, balancing, safety, wet exits, T-rescues and calm water rolls. Advanced courses will include river safety and hydrology, whitewater risk assessment, advanced stroke technique and combat rolls. For those interested in competition paddling, the program will eventually offer coaching in three disciplines: freestyle, wildwater, and Olympic whitewater slalom. The State of Colorado is known for its world-class pool of consistently talented young paddlers. The Ark Valley River Riders paddling program is designed to cultivate that talent and offer additional support to our members, both on and off the water, to form one of the best paddling teams in the country. 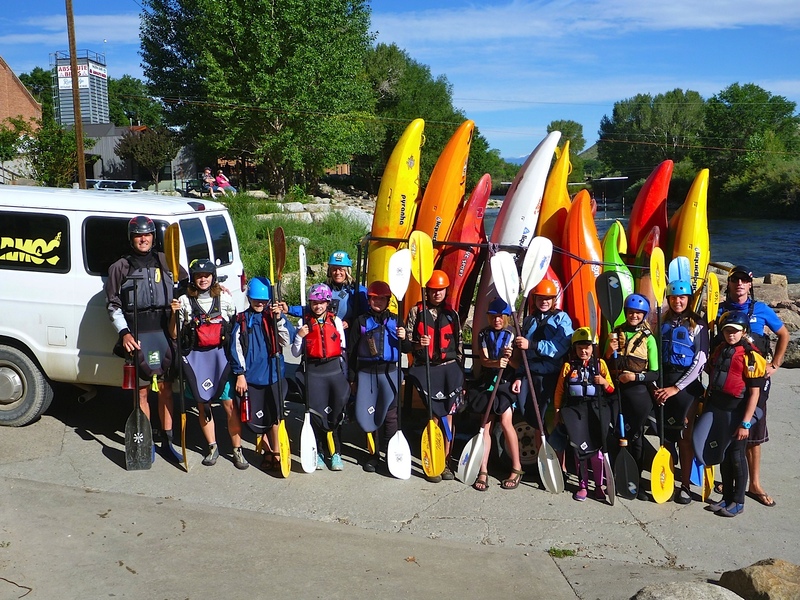 Rocky Mountain Outdoor Center is committed to making the Ark Valley River Riders a safe place for kids to learn and hone their skills on the water and in life.